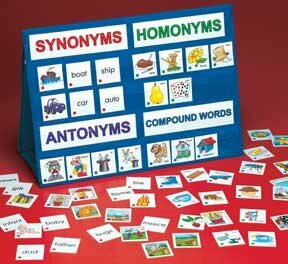 Homonyms, Synonyms, Antonyms and Compound Words included in this set. Tiles provide fun and captivating activity to develop reading and language skills. 20 sets of tiles for each skill are included (over 100 tiles total). Color coded for each activity. 19" x 19" nylon stand-up pocket chart with storage pouch and guide.